BASSG is proud to announce immediate availability of Project Builder Plus on August 30th 2012. Project Builder Plus is an application that speeds up SkySpark folio database creation, modification and data mapping processes from one unified interface for multiple projects. Maintain multiple SkySpark projects in one common user interface. Work on SkySpark projects offline and upload when the SkySpark server is ready for upload. Site, equip and point templates which enables the user to take snapshot of one record at a time. Site pack, equip Pack, point pack enables the user to take a snap-shot of the record with its recursive records and tags associated with the records. Tag Package is enables the user to assemble multiple tags into one to simplify the tagging process. Push changes back to SkySpark from your workstation. Size projects prior to project bid in 5-10 minutes with Overview reports. Obix connection manager and easy mapping of obix history to points with one click. Obix connections are referenced in the Obix Manager tab for each project. Never have to remember connection data, user name and password hence saving you time each time, you need to add a point to SkySpark. For building automation systems requiring the BACnet communications protocol, the new BACnet WattNode meter complements the company's Modbus® and LonWorks® meters, allowing almost any building automation system to seamlessly access electrical measurements including power, energy, voltage, current, and power factor. The peripherals and interfaces group is full of products that will give you greater monitoring and control in any application. From emergency switches to water leak detection to give early warning and shutdown in emergency situations to light level and occupancy sensors which can be used for security and energy savings. There are also bespoke user interface solutions for those projects that require a more specific solution. OC-PIRC ceiling mounted & OC-W wall mounted. Trend Control Systems USA (www.trend-americas.com) debuted the IQView8, an eight-inch, customizable, color, touch screen display that provides an interface into the Trend system. 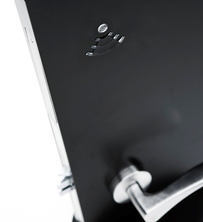 The sleek, modern, design of the IQView8 allows it to be placed nearly anywhere within a building. The IQView8 can be configured to display as much or as little detail of the building’s energy management system as desired, and can even be used as a dashboard to allow visitors to a building to receive an inside-view of how a building is performing. The IQView8 is more than just a simple display. The IQView8 can be used as a window into a larger system supervised by a central front end, like Trend’s 963 Supervisor, or can be used as a small building control system. It allows for complete system access viewed via schematics on a touch-screen. The depth of detail projected on the display can be as complex or simplified as you want. Spartan Peripheral Devices new wireless, battery-less, WT313F temperature sensor with set point will proportionally control an ME8300 wireless bidirectional communicating control valve actuator. Based on the EnOcean protocol it can be used as point to point or as part of the BAS network, and can be installed on our complete line of 2 and 3 way terminal unit control valve bodies. This product will open opportunities to convert old building towards LEED energy efficiency. The product is energy efficient as the room sensor harvests its own energy requirement from light. The valve actuator uses only 45mA while moving to a position, and 0 energy while in standby. It proportionally controls water flow with built in P+I for precise control, eliminating overshooting saving heating energy. It also allows retrofitting old buildings where installation of controls was impossible. Softing is currently releasing a series of articles on OPC Unified Architecture in a renown industrial automation magazine (German SPS Magazine). The series will give readers a comprehensive overview - covering among others origin and objectives, technical specifications and the current status of OPC UA. The series is based on the book "OPC - From Data Access to Unified Architecture" which is available already in its fourth edition. This newsletter gives you the opportunity to read the articles one month after their publication in SPS Magazine. “Essence by VingCard” is an entirely new concept in hotel locking design and technology. Taking minimalism to the extreme, Essence eliminates all lock hardware on the door by encasing all electronic components inside the door itself and making security virtually invisible to hotel guests. Although undetectable on the door exterior, Essence integrates VingCard Elsafe’s most advanced contactless locking solutions into the interior electronics, including Radio Frequency Identification (RFID) and Near Field Communication (NFC) compatible locking technologies. Essence by VingCard blends seamlessly with any hotel décor and takes the user-interface experience to a new level. For more information, please visit www.vingcardelsafe.com. WAGO Corporation's 750-830 BACnet Controller features innovative software with extended functionality and simplified system-wide integration/configuration. New functions include text messaging support (plain text on the management level) to provide facility managers with alerts. New features: "Loop" (control algorithms), "Event Enrollment" (alarm queries) object types and creation of a "Trend Log" and "Calendar" dynamic objects during runtime - no system reboot or external integrator. A new device manager eases object configuration and allows tabular data processing. The 750-830 BACnet Controller's native operation, which automatically generates a BACnet object for each standard I/O signal, has also received significant enhancements. I/O modules can now be subsequently added or removed from a fieldbus node without shifting object entities. Physical values are now scaled directly in the form of analog input/output objects. Additional analog value objects are no longer required in CoDeSys, simplifying mass-processing of data points and integration into external systems. Putting the control in the hands of the user. User Views is the brand new interface for eBMS/Mobile. Now, with the press of a button you can flip easily between Engineering Views and User Views, giving you the exact interface you are looking for, at no extra cost. Instantly viewing temperatures, adjusting set points, turning lights on and off and setting time schedules could not be easier in User Views. As the name suggests, its simple yet powerful widget-based interface ensures that any user can quickly and easily control every element of a site, whether large or small, local or remote. To find out more visit www.tyrrellproducts.com. Crestron today announced that its new 3-Series™ control systems now support the BACnet® communication protocol. Crestron 3-Series control systems with onboard BACnet®/IP support provide a scalable, IP-based platform for implementing fully integrated building management and automation. Built-in BACnet/IP support enables seamless integration with existing building management systems and other BACnet devices. All systems can now run independently and communicate with each other on the same high-powered Crestron platform, creating a truly smart building. Using Crestron 3-Series control systems, integrated control of lighting, shades, HVAC, AV, BMS, security, IT, and other connected systems now becomes faster, simpler and significantly more efficient.